This is a 950 sq. ft. cottage from 1941 that was just renovated last year. It’s located in St. George, SC (just outside Charleston). It has 2 bedrooms and 1 and 1/2 bathrooms. Our big thanks to Richard Hughes for sharing! So where is the rest of it? Have to agree. More pictures would be nice. It needs a swing on the beautiful front porch. I love it! So charming and practical. I really love the 600-1100 sq ft houses for family homes. You have a bit of privacy and room to move without bumping into each other all the time when there are multiple people sharing the space with you all the time, but you still can be efficient and ingenuitive with space and resources. I’m with Anne on the square footage thing. Although I’ve seen some smart examples of tiny, anything under 600 or 700 square feet, and I’d go nuts! 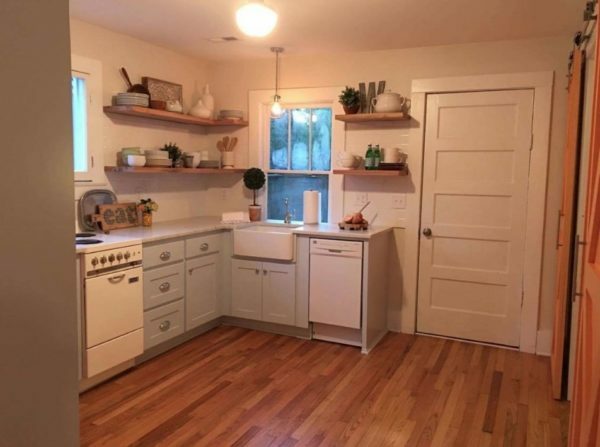 This home is adorable, I could definitely live there! Next post: Tour homes on wheels, backyard cottages and tiny homes for the houseless!